Struck in 1oz of 99.99% fine gold and silver, the pair of coins share designs that are emblematic of the historic event. Australia played a key role in bringing the Apollo 11 lunar landing to homes around the world. CSIRO’s Parkes radio telescope in New South Wales was one of three observatories chosen to receive TV signals from more than 350,000 kilometers away. 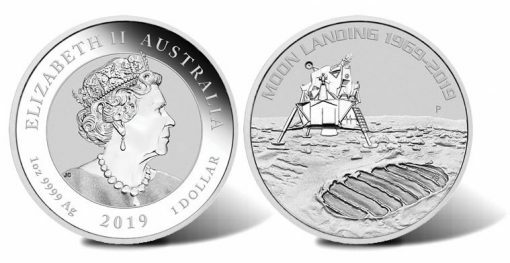 Designed by Lucas Bowers, coin reverses (tails side) offer a depiction of the Lunar Module Eagle landing on the Moon behind a large footprint on the Moon’s surface. 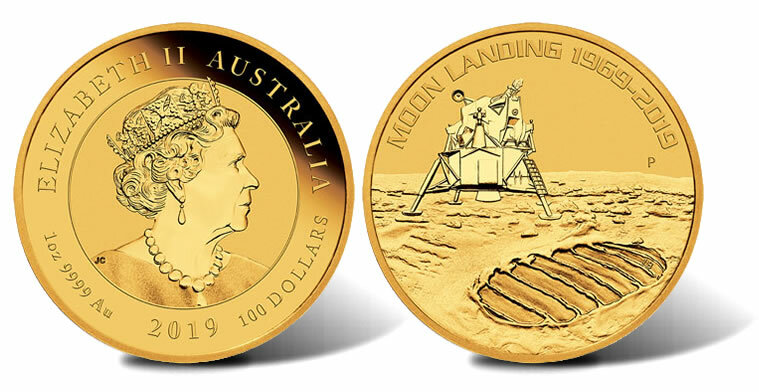 Inscriptions above the scene include "MOON LANDING 1969-2019" and The Perth Mint’s "P" mintmark. Obverses (heads side) show Jody Clark’s effigy of Queen Elizabeth II with surrounding inscriptions of ‘ELIZABETH II," "AUSTRALIA," the year "2019" and the coin’s weight, fineness and denomination. Australian buyers can order the bullion coins from www.perthmintbullion.com. Buyers outside of Australia are directed to check for the coins’ availability from worldwide bullion dealers. Joe it is worse…….fuguly I could do better & I have a 12th grade Design degree….. Hurry Hurry, New “cockroach” coins are going fast!! Buy them now before the god of coin collecting Mike Mezack gets them all !!! I think it looks fine on the obv but I agree the reverse is garbage. I don’t know, the Queen looks pretty pissed off on this one. She looks like she is having a nightmare !! !